I'm thrilled to return to Tuning Speculations, the inimitable conference organized by The Occulture in Toronto. I'll share thoughts about a phenomenon I'm calling "Personalities Without People." 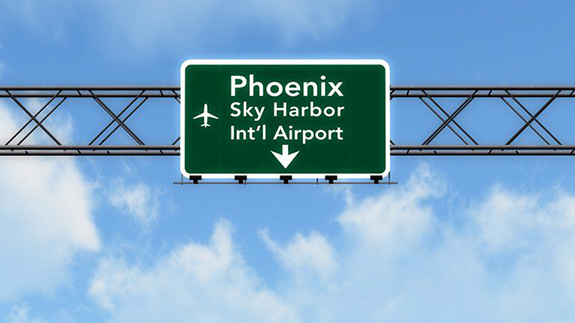 In November, I'll be traveling to Arizona with Autoresponder.exe to participate in the SLSA Annual Conference, "Out of Time." I'm thrilled to be returning to SLSA (birthplace of OOF) for another year, and especially happy to do so for the first time as a visual artist. I'll participate in the "Out of Time" SLSA exhibition, curated by Maria Whiteman in the Harry Wood Gallery, and I'll serve as a respondent for a panel featuring three brilliant friends, Claire Brault, Heather Davis, and Gloria Kim. Thank you, Hyperallergic and Brooklyn News 12, for covering Maritime Messaging: Red Hook! "Using AI to Pull Memories from Red Hook's Waters", Hyperallergic, October 24, 2017. "Public art project shows conversations with water", Brooklyn News 12, October 29, 2017. What if water is a witness? Surrounding Brooklyn and neighborhoods like Red Hook, water remains a constant in a rapidly changing borough. 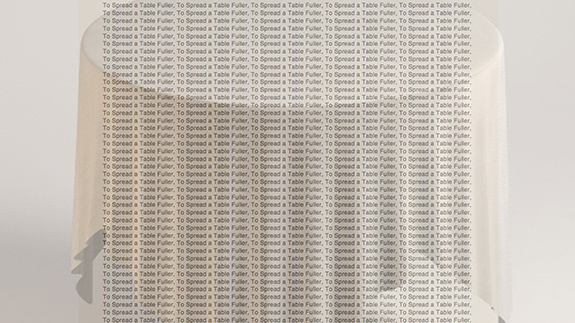 Human history fluctuates over time, rising and falling, ebbing and flowing, booming and busting. What if water has absorbed it all? Please join me on Sunday, October 29 for Maritime Messaging: Red Hook, a new performance featuring the Atlantic Ocean, an archival AI, and the voice of Siri. Performances will take place on NYC Ferries traveling from Wall Street to Red Hook on Sunday, October 29, 2017, the 5th anniversary of superstorm Sandy from 9:30am-5:54pm. A reception will be held at the MARY A. WHALEN, home of PortSide NewYork (Pier 11, Atlantic Basin, Red Hook, Brooklyn) from 6:00 pm to 8:00pm. The performance will be accompanied by a sound installation at the MARY A. WHALEN from 9:30am to 8pm. Produced in collaboration with Pioneer Works and PortSide New York. This fall I'm honored to return to the MacDowell Colony where I'll be working on new projects as I begin a year sabbatical from teaching. 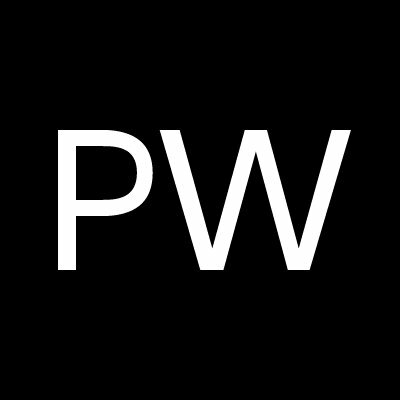 I'm extremely excited to be starting a tech residency at Pioneer Works, an amazing art center in Red Hook, Brooklyn this summer. I'm starting several new projects, training neural nets with telegrams, using speech recognition on hydrophone recordings, and more! Disorientalism will share four videos from our ongoing series "The Food Groups" as part of a screening at Miranda Kuo Gallery. The screening is organized in conjunction with the exhibition "To Spread a Table Fuller" with works by Jaclyn Jaconetta, Tiffany Jaeyeon Shin, and Alexandra Wilson, in which the artists "confront the systemic erasure of gendered and racialized bodies within an infinite cycle of marketing exchange, domestic services, and cultural imperialism." The screening showcases subjects in ceaseless oscillations between visibility/ invisibility to highlight bodies and perspectives that face erasure or are detained in the uncanny valley. I'm heading to Rome, where I'm excited to be participating in Fear and Loathing of the Online Self: A Savage Journey into the Heart of Digital Cultures, hosted by John Cabot University and Roma Tre University and produced in collaboration with the Institute of Network Cultures. I'm humbled to be presenting my work alongside some of my long-time heroes in new media. Together we'll take up questions about: Online subjectivity theory, Behind and beyond the selfie, Artistic practices of the online self, and Politics and aesthetics of mask design. I'm honored to be included in the Hunter College MFA Program's first Alumni exhibition, Homecoming, at the Leubsdorf Gallery, on view April 8 through May 8. Please join me for a special reception April 28! The Hunter College Art Galleries are pleased to announce Homecoming, an exhibition of four Hunter Studio Art MFA alumni: Katherine Behar (MFA 2009), Oliver Herring (MFA 1991), Julia Jacquette (MFA 1992) and Yashua Klos (MFA 2009). The exhibition, scheduled to open in conjunction with Hunter college-wide Alumni Reunion on Saturday, April 8, 2017, will be on view through Sunday, May 7, 2017. The exhibition marks the inauguration of a new initiative, also entitled "Homecoming," developed in collaboration with the MFA Student Organization, and designed to foster connections between current Hunter MFA students and Hunter MFA alumni in a variety of ways, including an annual exhibition in the Bertha and Karl Leubsdorf Gallery. This year's inaugural Homecoming exhibition offers the opportunity to highlight the work of just some of Hunter's internationally recognized alumni artists, allowing our current students to gain a greater understanding of their practice in advance of the visits, interviews, lectures, and tours that are part of the broader initiative. During this exhibition, the gallery will also collaborate with the alumni artists to organize undergraduate-specific programming. I'm very grateful to Kaya Genc and Ulya Soley for including a discussion of my work in "Waste Not, Want Not: The Future of Contemporary Art," their insightful review of Nicolas Bourriaud's lastest book, Exform. Thank you, Kaya and Ulya! It's here! "You Can't Have Me: Feminist Infiltrations in Object-Oriented Ontology" is Rebekah Sheldon's review of Object-Oriented Feminism now available at LA Review of Books. Thank you, Rebekah! Check out Jesse Bordwin's excellent review of Object-Oriented Feminism at Critical Inquiry. Thank you, Jesse! The Stamps School of Art and Design will host a panel on Object-Oriented Feminism and the question of "a feminist object" posed by OOF author Irina Aristarkhova. I will be in discussion with Irina Aristarkhova and two Stamps alumnae, Emily Dibble (BFA 2016) and Kit Parks (BFA 2015), and student Riley Hanson (BFA 2017). Is painting an object that can be objectified? Should objects give "consent"? This panel discusses these questions within the context of Object-Oriented Feminism (Minnesota University Press, 2016), a new book edited by guest speaker Katherine Behar and including a chapter by Stamps Professor Irina Aristarkhova, and artwork made by Stamps students (Hanson, Parks, Williams, Dibble). Copies of the boo will be available for purchase, signed by the authors, following the event. I'm excited to visit Rensselaer Polytechnic Institute this spring. 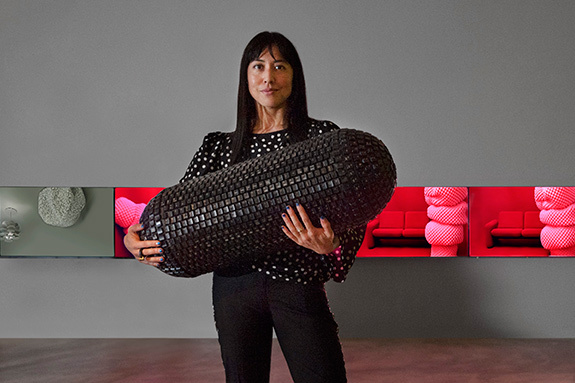 I will present a lecture on my art practice and object-oriented feminism at EMPAC on March 9. 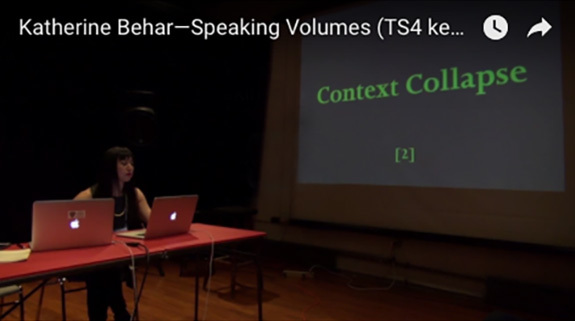 Katherine Behar is an interdisciplinary new media and performance artist based in New York. In "Optimized, not Optimistic," she presents her artwork, highlighting the often confounding--and sometimes rebellious--ways that people and technologies manage to coexist in digital labor. Using object-oriented feminism, Behar's artworks connect feminist and post-colonial histories with posthuman solidarity. Instead of claiming special importance for human subjectivity, she seeks out shared conditions among humans and nonhumans and finds in these connections unexpected traces of traditional gender, racial, and class dynamics. This lecture includes examples of Behar's videos, interactive installations, sculptures, and performances, alongside episodes from media history and popular culture. Copies of Behar's recent book, Object-Oriented Feminism, will be available for purchase, signed by the author, following the event. 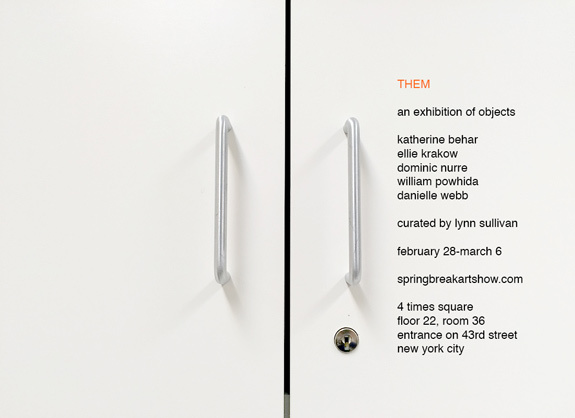 I'm very excited to participate in THEM, a group show curated by Lynn Sullivan at SPRING/BREAK Art Show during Armory work in New York. Please check back for details coming soon! THEM is an exhibition of objects. 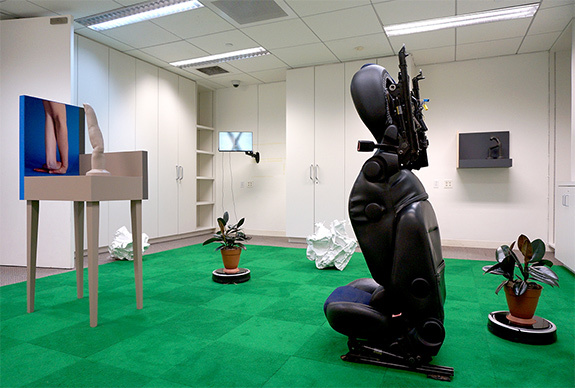 The works of Katherine Behar, Ellie Krakow, Dominic Nurre, William Powhida and Danielle Webb fill a space with inanimate, machinic, and plant forms that take on human roles of kin, adversary, self or other. Attention is given to the unseen, unsung, or overblown labor of these forms and to their complex histories of cultural value. I'm honored to present my work in conversation with Yuliya Lanina at the University of Texas Austin's Center for Arts and Entertainment Technologies. I'll be visiting classes and lecturing February 21 and 22.